Kuala Lumpur: 1Malaysia Development Bhd (1MDB), the government-owned firm in charge of setting up the Kuala Lumpur International Financial District (KLIFD), has picked Akitek Ju-rurancang (Malaysia) Sdn Bhd and its international partner, Machado Silvetti and Associates (MSA), as the project's master planners. The US$8 billion (RM23.7 billion) KLIFD, one of Malaysia's biggest projects, aims to tightly cluster financial institutions and top global firms on 30.3ha of land in the Imbi area, fronting Jalan Tun Razak here. A detailed masterplan of the project is expected to be completed in the first quarter of next year, 1MDB said in a press statement yesterday. The project is a joint venture between 1MDB and Mubadala Development Corp, Abu Dhabi's investment arm. 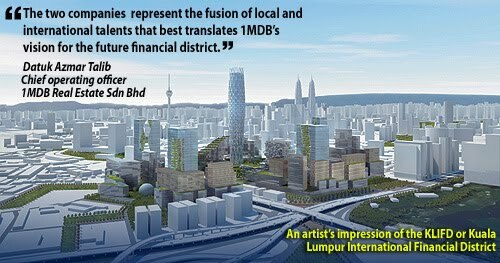 1MDB had, in late 2010, organised a design competition for master planners, attracting some of the world's best. 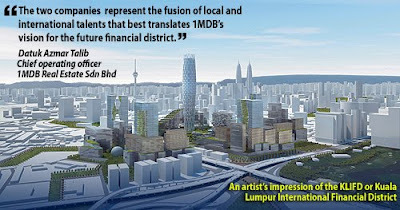 "The two companies (Akitek Jururancang and MSA) represent the fusion of local and international talents that best translate 1MDB's vision for the future financial district, through their concept and rendering of the masterplan," said Datuk Azmar Talib, chief operating officer of 1MDB Real Estate Sdn Bhd, a subsidiary of 1MDB. He said the two companies share a vision for a "highly functioning, interesting, innnovative and aesthetically pleasing urban district" that would establish KLIFD as a financial centre of choice. Construction work is expected to take off in June, according to news reports earlier this year. The project is seen to be providing significant stimulus for the construction and related industries. It will leverage on Malaysia's existing strength in Islamic finance and play on its strategic location to complement other financial centres within the region. The RHB banking group is expected to be the first to set up presence there. According to 1MDB, the Akitek Jururancang-MSA partnership is to deliver a sustainable, modern and progressive KLIFD. This will be projected through buildings, a pedestrian-friendly green public realm and seamless links to public transportation. "We have a real contribution to make to the urbanscape of Kuala Lumpur in line with the objective of the Greater KL initiative to make Kuala Lumpur a world-class city. The increasing emphasis on the greening of the city - as manifested in the recent River of Life and upgrading of the Lake Gardens - signals a welcome reception of KLIFD's unique 'Financial Centre in the Park'," Akitek Jururancang's managing director Datuk Seri Esa Mohamed said in the same statement. The River of Life is a project name for the beautification of a 10.7km stretch of the Klang and Gombak river. Akitek Jururancang's partner MSA, a US-firm based in Boston, has worked on projects like The Mint Museum (Charlotte, North Carolina) and the Boston Public Library. It won an architecture prize last year for its work on the Suliman S. Olayan School of Business at the American University of Beirut, Lebanon. KUALA LUMPUR: Investors looking for exposure to the Penang property market have naturally gravitated to the island, with Eastern & Oriental Bhd being the current hot favourite. They have largely ignored the mainland. But if the latest sales numbers from leading mainland Penang player Tambun Indah Land Bhd are any indication, property companies focusing on the mainland could look as interesting as those across the narrow South Straits that separates it from Penang island. Listed in January this year, Tambun Indah, a leading mainland Penang property player, yesterday announced a 54.2% jump in revenue for 1HFY11 ended June 30 from RM57.32 million to RM88.4 million. In a statement, managing director Teh Kiak Seng attributed the increase to contributions from ongoing development projects. However, higher costs narrowed the growth in pre-tax profit to 16%, or RM21.76 million in 1HFY11, compared with RM18.76 million in 1HFY10. Due to higher minority interests, net profit fell 16% to RM11.12 million in 1HFY11, or 5.03 sen per share, compared with RM13.25 million in 1HFY10. The group registered a net profit of RM23.76 million in 2009, slightly higher than RM23.47 million a year before. The substantial jump in revenue may be an indication that the property boom on wealthy Penang island is spilling over to the mainland. And the company offers good dividends too. It has proposed an interim single-tier dividend of 4.6 sen, to be paid on Sept 7. This translates into a net dividend yield of 6.1%. “We commenced construction of five new projects in 1HFY11, recognising the rising demand for residential properties following the rapid industrial developments in mainland Penang. At the same time, we noted positive take-up rates for our ongoing Pearl Garden and Pearl Villa developments, which together constitute approximately half of 1HFY11 group revenue,” Teh said. Tambun Indah embarked on five new projects in 1HFY11 — Pearl Villas, Dahlia Park, Impian Residence, Tanjung Heights and Capri Park. Teh expects these projects to contribute to the group’s performance in the remaining half of FY11 ending December. “At present, our GDV [gross development value] stands at RM1.7 billion, which will last us until 2016, with unbilled sales of RM225 million,” he wrote, adding that he is optimistic of the group’s performance for the remaining half of FY11. Tambun Indah started operations in 1995. Its maiden project was Taman Tambun Indah, a township of over 800 houses, 300 bungalows, 40 semi-detached units, shop offices and terraced houses. The group has a landbank of over 121ha, mainly in mainland Penang. In a year that saw most IPOs falling under water, Tambun Indah’s shares were last traded at 76 sen, up 8.6% from the IPO price of 70 sen. The stock has traded between 86.5 sen and 65.5 sen since it was listed, and is currently trading at 1.1 times its book value of 68 sen as at June 30. The company has a market capitalisation of RM168 million. Based on annualised earnings for 1HFY11, it is trading at a price-earnings ratio of around 7.6 times earnings for this year. In an earlier note issued during the listing, MIMB Research said it expects Tambun Indah’s net profit to grow by 10% in 2011 and 11% in 2012, mainly underpinned by property projects in the pipeline with a GDV of RM1 billion. “Dividend yield of 7% to 8% is one of the highest in the property sector. We value Tambun Indah Land at a fair value of 81 sen, based on a 30% discount to realiasable net asset value,” it said. KUALA LUMPUR: MAGNA PRIMA BHD is making into foray into Australia to undertake a mixed residential and commercial project in Melbourne with an indicative gross development cost of A$148 million (RM482.18 million). The company said on Friday, Aug 5 it expected to record a profit of A$62 million (RM200.32 million) from the project. Magna Prima had on Friday signed a conditional contract of sale with Yucai Australia Pty Ltd to purchase 2,761 sq metres of land for A$26 million (RM84.01 million) on Beckett Street, Melbourne. The land would be developed into a mixed residential and commercial project to be known as Dynasty Living. The project would comprise a contemporary 26 level mixed development of 320 residential apartments contained within a main tower, complemented by seven retail/commercial tenancies. The apartments and retail/commercial tenancies would have 130 single and 51 tandem car spaces providing for 181 apartments. “The indicative gross development cost is A$148 million with an expected profit of A$62 million. Construction is expected to commence in the fourth quarter of 2011, and to be completed in 2013,” it said. Magna Prima said the development cost would be its own funds and/or bank borrowings. The planning permit from the Minister of Planning was obtained on May 5, 2002 and amended on Oct 6, 2009. “As part of the company’s plan of putting a strong footing for growth, the proposed acquisition will be the company’s first step in placing the group on the global map,” it said. Magna Prima said the proposed acquisition was in line with its strategy of acquiring niche suitable development land with strong potential for prime and sizable new developments. “The board is of the view that the proposed acquisition provides the group with a rare and valuable opportunity to venture into the robust, high-income and mature Melbourne property market,” it added. PETALING JAYA: Property developer SP Setia Bhd yesterday quashed rumours that it was among those eyeing a stake in property and hospitality company Eastern and Oriental Bhd (E&O). The company told Bursa Malaysia that while it would continuously assess possibilities for strategic partnerships and land-banking opportunities, it was not in any acquisition or takeover talks with E&O or its shareholders.